1. Alleviate low-back pain and improve range of motion. 2. Assist with shorter, easier labor for expectant mothers and shorten maternity hospital stays. 4. Enhance immunity by stimulating lymph flow—the body's natural defense system. 5. Exercise and stretch weak, tight, or atrophied muscles. 6. Help athletes of any level prepare for, and recover from, strenuous workouts. 7. Improve the condition of the body's largest organ—the skin. 9. Lessen depression and anxiety. 10. Promote tissue regeneration, reducing scar tissue and stretchmarks. 12. Reduce postsurgery adhesions and swelling. 13. Reduce spasms and cramping. 14. Relax and soften injured, tired, and overused muscles. 15. Release endorphins—amino acids that work as the body's natural painkiller. Uses soothing, tapping and kneading strokes to work the entire body, relieving muscle tension and loosening sore joints. Swedish massage therapists use five basic strokes, which anyone can learn and use on themselves and others. They are effleurage (stroking); petrissage (muscles are lightly grabbed and lifted); friction (thumbs and fingertips work in deep circles into the thickest part of muscles); tapotement (chopping, beating, and tapping strokes); and vibration (fingers are pressed or flattened firmly on a muscle, then the area is shaken rapidly for a few seconds). Targets chronic tension in muscles that lie far below the surface of your body. You have five layers of muscle in your back, and while Swedish massage may help the first couple of layers, it won’t do much directly for the muscle underneath. Deep muscle techniques usually involve slow strokes, direct pressure or friction movements that go across the grain of the muscles. Massage therapists will use their fingers, thumbs or occasionally even elbows to apply the needed pressure. Sports therapy is simply applied to athletic clients, according to what their tissues respond to, but does often incorporate stretch and joint movements. It is a great addition to training, or any level of exercise to assist muscle tissue in getting back to a neutral state. Many clients report less soreness and improved range, with fewer injuries. It offers pre-workout or pre-competition sessions that warm up the tissue and prepare it for endurance. Energy work has various names such as Reiki, acupressure, craniosacral therapies. It is easily applied within the context of other strokes, or on its own. It can be integrated with any other therapy. Energy work is often a light touch therapy application, but has truly deep tissue influences. It also can be very relaxing or described as a harmonizing and some even describe transcendental experiences, which may have a deeply healing or spiritual effect. A therapy intended to assist movement of fluid. Always a light, rhythmic touch therapy applied in specific areas where lymph nodes and lymph drainage routes are located. This therapy is intended for the reduction of inflammation, although not during active infection, and pathological edema. Pregnancy is a unique state of being for a woman and can take its toll on her emotional and energetic state, as well as her physical wellbeing. As a women’s body expands and changes the muscles are pulled and stretched and may cause pain or discomfort, along with postural distortion and fatigue. A prenatal massage can assist in reducing some of these distresses. Prenatal massage is performed with the client in a side lying position surrounded by pillows to help support both mother and fetus. It can be a purely relaxing massage or a session concentrating on specific issues. All of our therapists are fully trained in pre and post natal massage. Massage performed in a specifically designed massage chair. This massage is performed with the client fully dressed, does not utilize any creams, oils or lotions. Therefore, the intention is warming the tissues with combined trigger point therapy. It is a great way to introduce therapeutic touch to someone who has never received a massage. 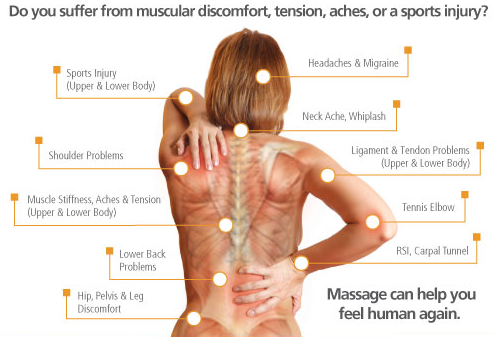 Massage relaxes muscle contractions, spasms, and relieves general body tensions. Massage increases the number of red blood cells especially in cases of anemia. Massage acts as a "mechanical cleanser" pushing along lymphatic fluids and hastening the elimination of wastes and toxic debris. Massage increases the blood supply and nutrition to muscles without adding to their load of toxic lactic acid, produced through voluntary muscle contractions. Massage thus helps to overcome harmful "fatigue" products resulting from strenuous exercise or injury. Massage improves muscle tone and helps prevent or delay muscular atrophy resulting from forced inactivity. Massage can compensate, at least in part, for lack of exercise and muscular contractions in persons who because of injury, illness or age are forced to remain inactive. In these cases, massage helps return venous blood to the heart and so eases the strain on this vital organ. Massage may have a sedative, stimulating or even exhausting effect on the nervous system depending on the type and length of massage treatment given. Transverse massage separates muscle fibers, undoing or preventing the formation of adhesions and trigger points. According to some authorities, massage may burst the fat capsules in the subcutaneous so that the fat exudes and becomes absorbed. In this way, massage combined with a nutritious but calorie-deficient diet can be an aid in reducing. Massage increases the general circulation and nutrition to the tissues. It is accompanied or followed by an increased interchanged of substances between the blood and the tissue cells heightening tissue metabolism. Massage increases the excretion (via the kidneys) of fluids and nitrogen, inorganic phosphorus and salt in normal healthy individuals. Massage encourages the retention of nitrogen, phosphorus, and sulphur necessary for tissue in persons convalescing from bone fractures. Massage stretches connective tissues, improves its circulation and nutrition and so brakes down or prevents the formation of adhesions and reduces the danger of fibrosis. Massage improves the circulation and nutrition of joints and hastens the elimination of harmful particles. It helps lessen inflammation and swelling in joints and so alleviates pain. Massage disperses the edema following injury to ligaments and tendons, lessens pain, tissue damage and helps facilitates movement.